Michigan Beats Notre Dame, Plays 'Chicken Dance' Song : The Two-Way Last night's college football game between the University of Michigan and Notre Dame was the final match-up between the longtime rivals to be played in Ann Arbor for a while. And Notre Dame's looming suspension of the teams' long-time rivalry inspired a unique musical choice. The Michigan Wolverines defeated the Notre Dame Fighting Irish Saturday night, 41-30 — and then celebrated by playing some polka. 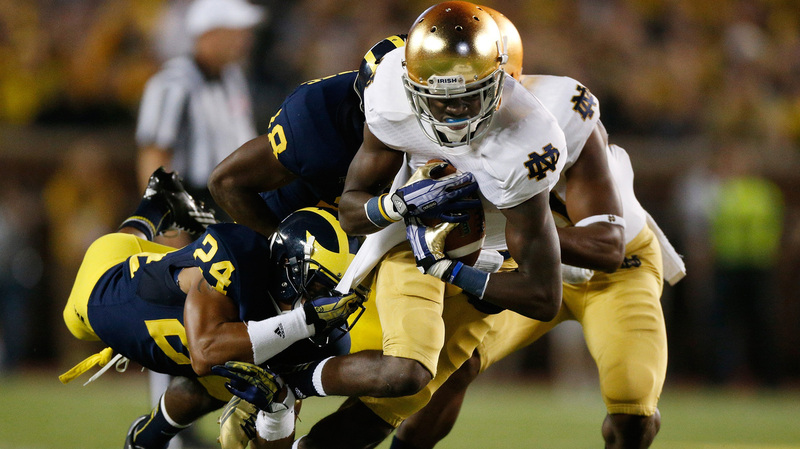 Here, the Irish's Chris Brown is tackled by Michigan's Delonte Hollowell after making a catch. Last night's college football game between the University of Michigan and Notre Dame was the final match-up between the longtime rivals to be played in Ann Arbor for a while, thanks to a looming suspension of their rivalry that was enacted by Notre Dame. Michigan won, 41-30, after stifling a late comeback. The two teams will meet again in Notre Dame's South Bend home in 2014 — but Saturday night's game is being hailed as a showcase of a classic rivalry, with several dramatic turnabouts and unpredictable moments. An NCAA record 115,109 people were at Michigan Stadium to watch the game — and many also heard Michigan's public address system blare "The Chicken Dance" song. As USA Today reports, it was played in apparent reference to Michigan coach Brady Hoke saying Notre Dame was "chickening out of" the rivalry earlier this year. "We also got a new American football attendance record, a phenomenal FAT GUY TOUCHDOWN, a 'TIMEOUT wait never mind whatever' moment and Eminem in the booth during halftime. Yeah. Eminem. What a game." And that rundown omits the fact that actor Mark Harmon was also at the game. Harmon's father, Tom, was Michigan's first Heisman Trophy winner; on Saturday night, Wolverines quarterback Devin Gardner wore a jersey bearing Harmon's number 98, which had been retired. The reasons behind Notre Dame's decision to halt the rivalry — and why it can put the games on hold — are complicated. As Pete Thamel writes for Sports Illustrated, the school says it wants to increase its exposure in games with teams in Texas, and in the Atlantic Coast Conference. Notre Dame may resume playing Michigan around 2020. But Thamel adds that the two schools put on a great show in one of their final games — for now, at least.